Fairy tales can come to U T S | Me fail? I fly! 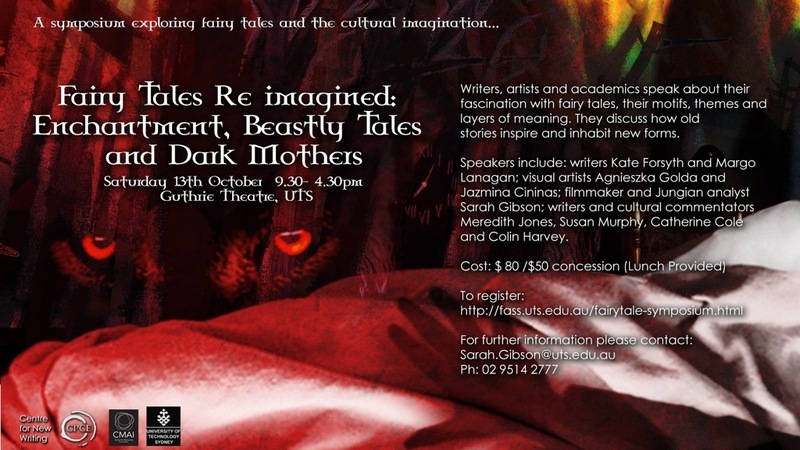 A symposium to be held on 13 October, at UTS, Sydney, exploring fairy tales and the cultural imagination. Writers, artists and academics speak about their fascination with fairy tales, their motifs, themes and layers of meaning. They discuss how old stories inspire and inhabit new forms. Of the speakers listed, in my ignorance i only know three: Sarah, who is a bit of a fairy tale polymath, and Kate Forsyth and Margo Lanagan, both billed as novelists, though I passionately hope Margo hasn’t forsaken what some see as her true calling as a writer of short stories. The symposium has been initiated by media artist Sarah Gibson, whose interactive online project ‘Re-enchantment’ can be found at http://www.abc.net.au/re-enchantment (link opens external site). It sounds like a fun way to spend a windy October Saturday in Sydney. If you’re interested you can find information and register at http://fass.uts.edu.au/fairy tale-symposium.html, or email Sarah. This entry was posted in Uncategorized and tagged fairy tales, Margo Lanagan. Bookmark the permalink.